First, please read "Supplemental Restraint System (SRS) Precautions" carefully. Your vehicle is equipped with a front passenger seat weight sensors as a part of the supplemental restraint system. These sensors are located under both of the front passenger seat rails. These sensors determine the total seated weight on the front passenger seat and monitor the seat belt buckle for the front passenger seat. The SAS unit is designed to prevent the front passenger front and side air bags and seat belt pretensioner system from deploying if the front passenger air bag deactivation indicator light illuminates. To reduce the chance of injuries caused by deployment of the front passenger air bag, the system deactivates the front passenger front and side air bags and also the seat belt pretensioner system when the front passenger air bag deactivation indicator light illuminates. 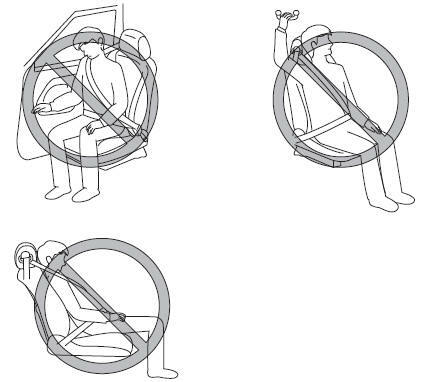 Refer to the following table for the front passenger air bag deactivation indicator light illumination conditions. This system shuts off the front passenger front and side air bags and seat belt pretensioner system, so make sure the front passenger air bag deactivation indicator light illuminates according to the following table. The air bag/front seat belt pretensioner system warning light flashes and the front passenger air bag deactivation indicator light illuminates if the sensors have a possible malfunction. If this happens, the front passenger front and side air bags and seat belt pretensioner system will not deploy. This indicator light illuminates to remind you that the front passenger front and side air bags and seat belt pretensioner will not deploy during a collision. *1 If a larger child sits on the front passenger seat, the sensors might detect the child as being an adult depending on the child's physique. *2 If a smaller adult sits on the front passenger seat, the sensors might detect the person as being a child depending on the person's physique. The curtain air bag is ready for inflating regardless of what the front passenger air bag deactivation indicator light on/off condition chart indicates. If the front passenger air bag deactivation indicator light does not illuminate when the ignition is switched ON and does not illuminate as indicated in the front passenger air bag deactivation indicator light on/off condition chart, do not allow a child to sit in the front passenger seat and consult an Authorized Mazda Dealer as soon as possible. The system may not work properly in an accident. A rear passenger pushes up on the front passenger seat with their feet. Luggage or other items placed under the front passenger seat or between the front passenger seat and driver seat that push up the front passenger seat bottom. Any accessories which might decrease the total seated weight on the front passenger seat are attached to the front passenger seat. The front passenger front and side air bags and seat belt pretensioner systems will deactivate if the front passenger air bag deactivation indicator light illuminates. Luggage or other items are placed on the seat with the child in the child-restraint system. A rear passenger or luggage push or pull down on the front passenger seatback. Luggage or other items are placed on the seatback or hung on the head restraint. Heavy items are placed in the seatback map pocket. Liquids are spilled on the seat. The front passenger seat is moved backward, pushing into luggage or other items placed behind it. The front passenger seatback contacts the rear seat. Luggage or other items are placed between the front passenger seat and driver seat. Any accessories which might increase the total seated weight on the front passenger seat are attached to the front passenger seat. Do not place sharp objects on the front seat bottoms or leave heavy luggage on them. Do not spill any liquids on the front seats or under the front seats. Adjust the front seats as far back as possible and always sit upright against the seatbacks with seat belts worn properly. If you place your child on the front passenger seat, secure the child-restraint system properly and slide the front passenger seat as far back as possible . The system requires about 10 seconds to alternate between turning the front passenger front and side air bags and seat belt pretensioner system on or off. The front passenger air bag deactivation indicator light may illuminate repeatedly if luggage or other items are put on the front passenger seat, or if the temperature of the vehicle's interior changes suddenly. The front passenger air bag deactivation indicator light may illuminate for 10 seconds if the total seated weight on the front passenger seat changes. The air bag/front seat belt pretensioner system warning light might illuminate if the front passenger seat receives a severe impact. If the front passenger air bag deactivation indicator light does not illuminate after installing a child-restraint system on the front passenger seat, first, re-install your childrestraint system according to the procedure in this owner's manual. Then, if the front passenger air bag deactivation indicator light still does not illuminate, install the childrestraint system on the rear seat and consult an Authorized Mazda Dealer as soon as possible. If the front passenger air bag deactivation indicator light illuminates when an adult is seated in the front passenger seat, have the passenger re-adjust their posture by sitting with their feet on the floor, and then re-fastening the seat belt. If the front passenger air bag deactivation indicator light still illuminates, move the passenger to the rear seat. If sitting in the rear seat is not possible, slide the front passenger seat as far back as possible. Consult an Authorized Mazda Dealer as soon as possible. The buckle switches on the front seat belts detect whether or not the front seat belts are securely fastened and further control the deployment of the air bags.